Successfully Added Tire Pressure Monitoring System - 4 Sensors, Real-Time Data, Tire Pressure, Tire Temperature, Tire Leaking Warning Alarm to your Shopping Cart. With the TP620 car tire pressure monitor, you will be able to keep constant track of your tire pressure and temperature while driving your car. Perfect for those of you that often travel long distances, this car gadget immensely increases your traffic safety and fuel efficiency. Its plug and play design makes it easy to install and operate. Simply attach the four external sensors to your tires, plug in the miniature LCD display into your car cigarette lighter, and you’ll be all set to enjoy all its amazing features. Supporting up to four tires at once and providing accurate real-time information, you can be assured that this tire pressure monitoring system always keeps you up to date on the latest status of your tires. Thanks to its compact design, the monitor of this tire pressure monitoring system can be attached easily to your car cigarette charger without taking up too much space. Displaying all data in color – you’ll always be provided with a clear overview. Whenever your tire pressure or temperature reaches uncommon levels, this amazing car gadget will reach out to you through both visual and audio alarms. Thanks to these safety features, you’ll always be able to detect problems such as a leaking tire on time and solve them before a potential accident would happen. The four sensors that come with this tire pressure monitoring system shut down automatically 10 minutes after your car has stopped moving – ensuring an energy efficient usage. Additionally, the sensors will start up again by themselves whenever you start driving – instantly providing you with real-time information. Increase your traffic safety and fuel efficiency – this amazing car pressure monitor is the ultimate gadget for those of you that enjoy long road trips abroad. 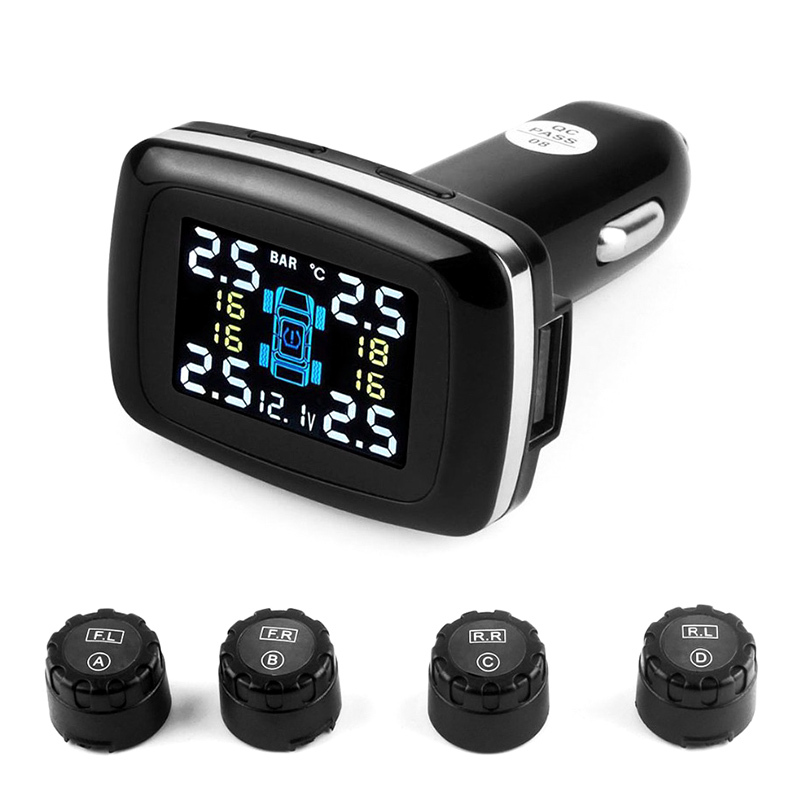 This tire pressure monitoring system comes with a 12 months warranty, brought to you by the leader in electronic devices as well as wholesale electronic gadgets.. This unit is not compatible to 6-tire RV, truck, trailer with a longer body.